Isn't it wonderful how a new year brings with it the desire to get our lives organized? That's been especially true for me this year—since I'm writing a book, I don't have time to be disorganized! That doesn't exactly look like the personal space of an organized person, does it? 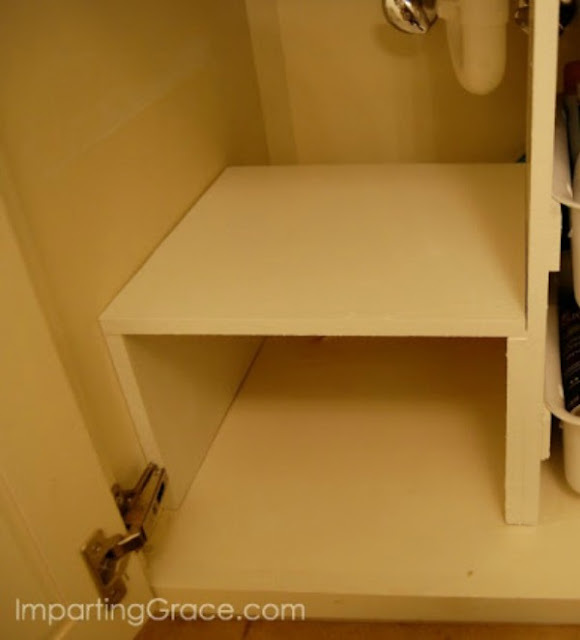 To be honest, I was a little stumped about how to organize this cabinet, since I knew I couldn't add any kind of stationary fixtures that would block access to the plumbing. But just about anything would be better than the mess I had, right? 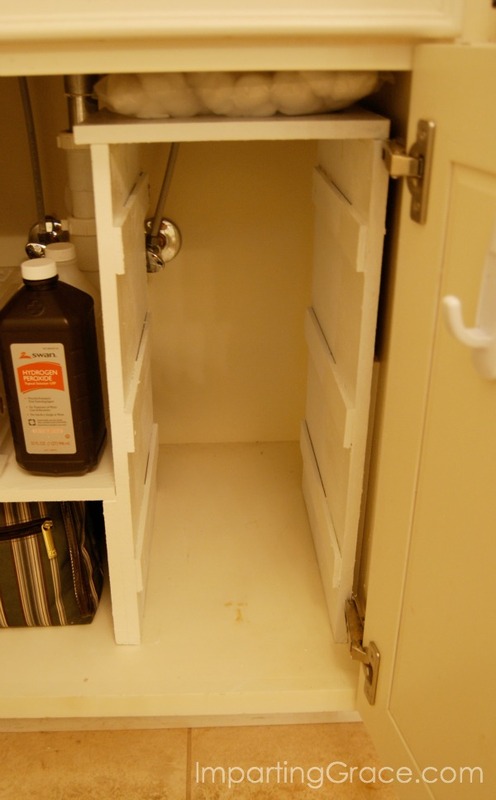 I started by removing everything from the cabinet and giving the interior a good wipe-down. As you can imagine, I threw away a LOT of what was in that under-cabinet mess! Your list might be different, but this was what I needed. Since my space is not very big, I decided to do 12" deep shelves on one side and pull-out bins on the other side. I started by buying 12" boards and painting them white. I recommend wood for under-sink shelves, since MDF will be ruined if it gets wet. 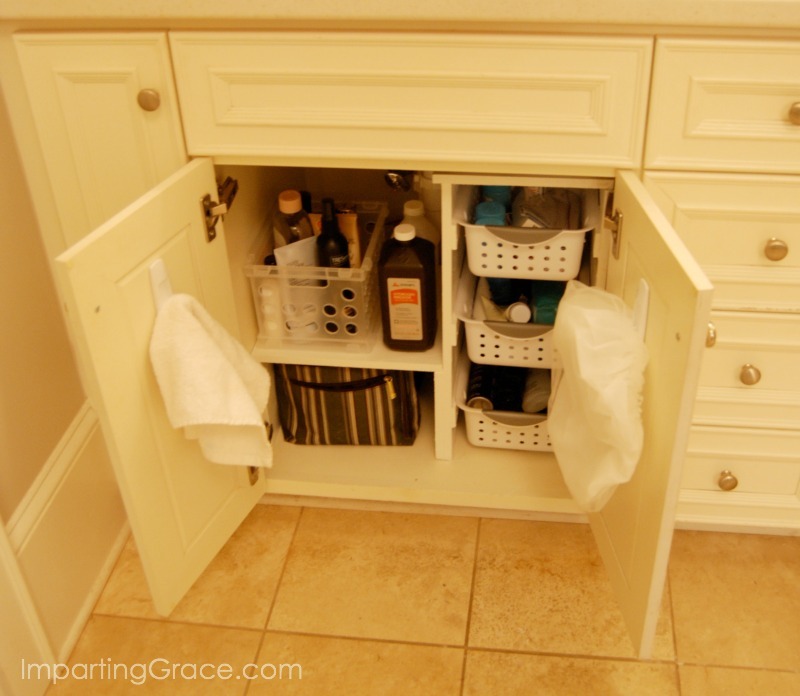 Next I created my pull-out bins, since those had to be precisely the size of my baskets. I used these Sterilite Ultra baskets. 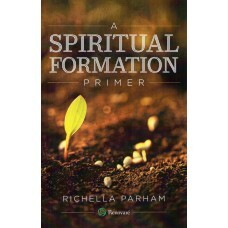 I bought mine at Target; you can find also find them at Walmart or from amazon.com (affiliate link). The baskets will simply hang on those side runners and pull partly or completely out for easy access. Note that I couldn't place the right side support completely against the wall of the cabinet or else the baskets would run into the hinge. I simply placed a piece of wood on the right side so that the shelf unit has something to stand against. For the other side of the cabinet, I made two shelves. The size of the shelves was determined by the space I had left in the cabinet after making the pull-out bins. The shelves were easy to create. I simply allowed the floor of the cabinet to function as one shelf, then built another little "table" of two identical side supports plus a board to lie across the top. The whole thing sits in front of the plumbing. 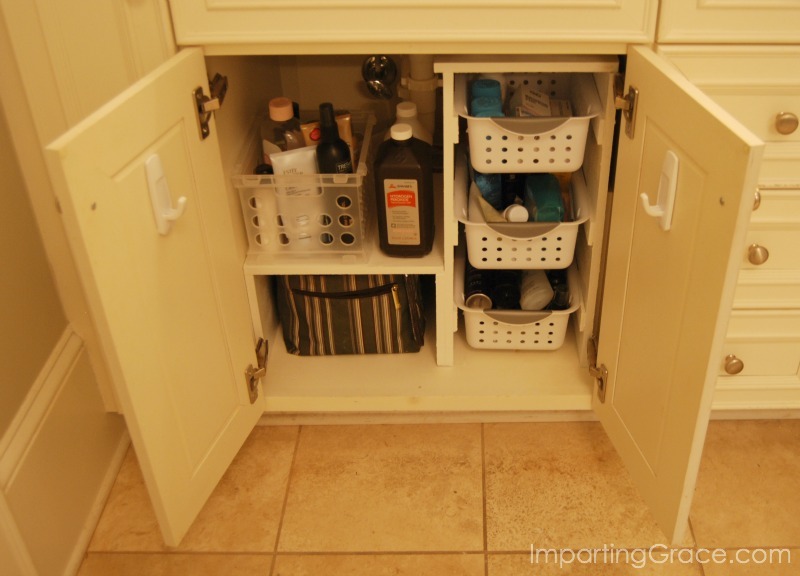 It stays in place because it's pushed firmly up against the wall of the cabinet on the left side and against the pull-out bin "wall" on the right. Every bit of these shelves is completely removable. None of the pieces is sturdy by itself, but when placed all together, it's firmly wedged into the space and is quite sturdy! 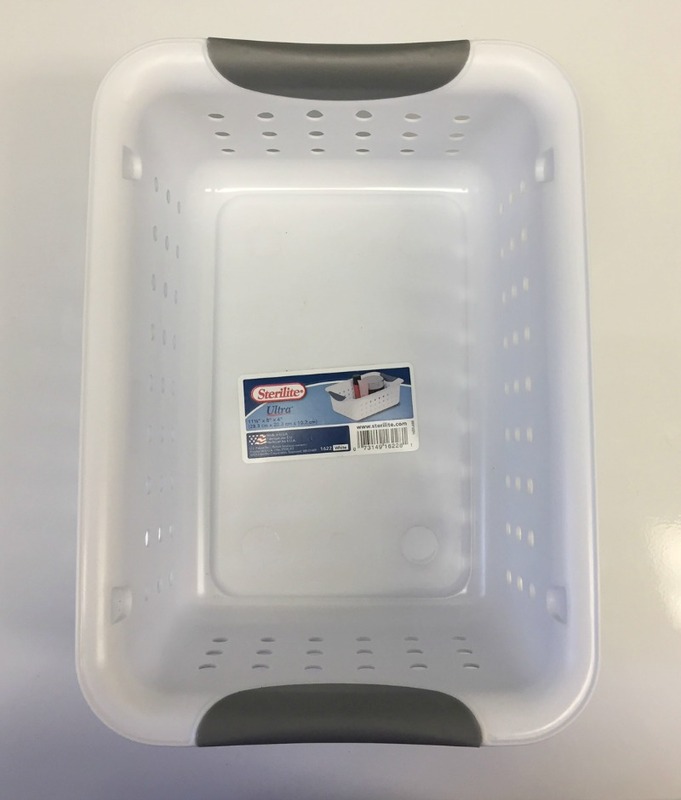 As you can see, I used another basket to corral some of my tall items. Under the tall items are my travel bags. I keep those bags loaded with toiletry items. Behind the striped bag is a quart-sized Ziploc bag with small containers of liquids. I try never to check luggage when I fly, so all my liquids must be in containers of 3 ounces or less. I breathe a sigh of relief when I open this cabinet now. Everything I need is at my fingertips, and it can all be easily removed when need be. 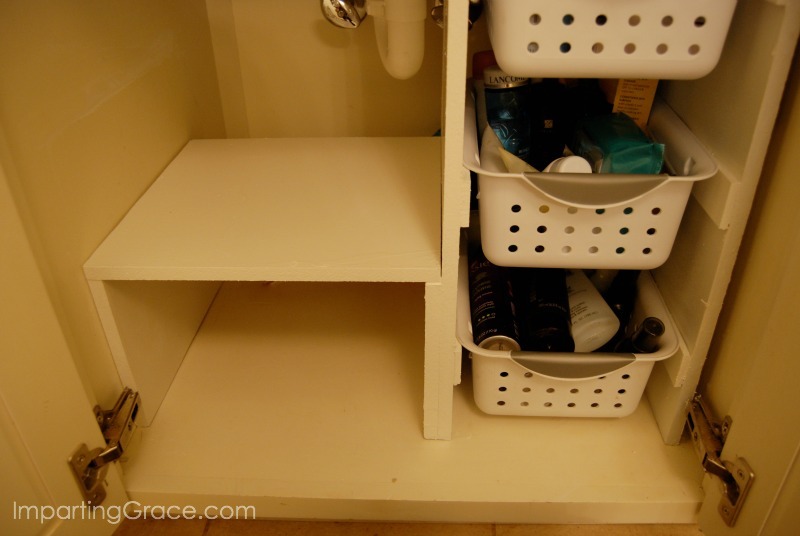 Have you completed any good organizing projects lately? I'd love to see! What an improvement! I need to copy this idea for under my kitchen sink. Very clever - I like an organized cupboard, but on occasion it looks like your first photo! WOW...what a great transformation...you did great! 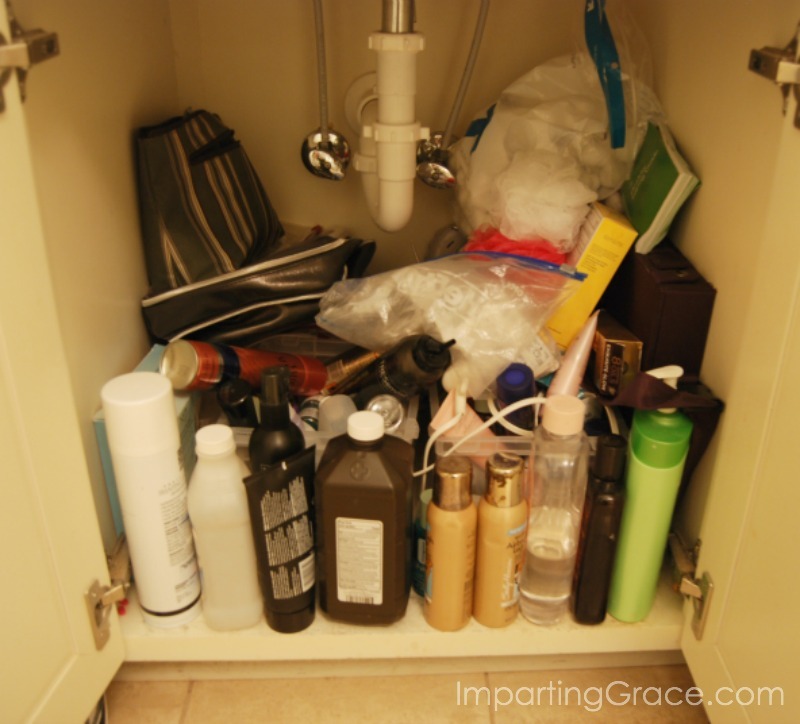 I thought I was the only one who had an area under the bathroom sink that looked like your before picture! That's awesome! You did a right nice job, Richella! It was a great transformation, and I totally get how you feel when you open those doors....being organized relieves so much stress.